Clare and I are now back from our short break in Florence. We had a wonderful time, and whilst we did far too much to be able to describe this as a relaxing holiday, it was certainly a refreshing one. As we look back on our all too brief stay in the city, it’s hard to believe that we’ve seen so many beautiful things over the last few days. 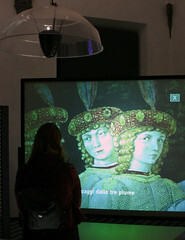 There was an element of cultural overload at one or two points perhaps, and it was far too easy to get blasé about yet another Fra Angelico fresco – much like eating a whole box of chocolates, every day. Rather than giving a ‘what we did on our holidays’ type post, just a few of the highlights and travellers tips. We flew into the newly re-opened Florence airport with Meridiana , an Italian low(ish) cost airline: there’s a minimalist meal on board and they allocate seats, which at least avoids that dash for the plane. Our first view of the Duomo and the rest of the city from the plane was very special. Florence airport is fairly tiny, but it’s only a 15 minute bus ride into the city centre. As this was Italy, we ate very well. Highlights would be Cingale Bianco on the south bank, not far from Ponte Vechio for a late Sunday lunch, the place being reassuringly packed with Italians, and a wonderful, relaxed atmosphere. We had a great dinner at La Giostra on Monday evening – complimentary prosecco, a chat with the proprietor, who’s a real character, and vast portions of delicious food, which we hardly did justice to. It’s worth booking ahead here. The walk up to San Miniato al Monte was hard work after our Sunday lunch, but well worth it, and made all the easier by getting caught up in a Franciscan Stations of the Cross procession – we made it in time for vespers, sung in Gregorian chant in an ancient crypt, and then had chance to look round the church afterwards – the best bit was probably the frescoed sacristy, but there was much else worth seeing here. The view over Florence from the church was breathtaking. The tiny magi chapel in Palazzo Medici Riccardi was amazing – the altar piece is a rather lovely Virgin and Child (now a contemporary copy of the Lippi original), but all of the walls are covered in wrap-round frescos by Gozzoli depicting the adoration of the magi, in incredible detail, with various Medici family members, friends and employees being depicted in the kings’ entourages – there was just so much to take in, and lovely to have the time to do so. They’ve recently set up a separate room to deal with the interpretive stuff, using large project screens and gesture tracking – nicely done, both in terms of the information available and the whiz-bang interface, although it seems a shame that really only two people can use this at a time. Both the Duomo and Santa Croce were something of anticlimaxes, and are surprisingly dark inside, at least compared to north European gothic churches, where buttresses allow for larger windows and thus interiors flooded with light. That said, neither are at their best at the moment, with various bits of scaffolding taking up parts of the interior, especially at Santa Croce. However, both have super museums attached. The Opera della Duomo museum currently has an exhibition of Arnolfo di Cambio sculptures on, and it was interesting contrasting his sculpture with contemporary painting. The museum at Santa Croce got better and better as we made our way round, and as the tourist crowds got sparser and sparser, culminating with Gaddi’s fresco of the last supper, taking up the whole width of the west wall of the monastic refectory, and, according to last night’s BBC2 programme, one of the inspirations for Leonardo da Vinci’s last supper. We’d booked ahead for the Uffizi, which was jolly wise in retrospect, as the queues were quite scary, even early on in the day. Unfortunately we’d not bothered with tickets for the Accademia, and didn’t make it there at all, as the queues were even worse. 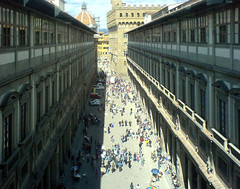 The Uffizi gallery itself is an overwhelming place, apparently the world’s first purpose built art gallery – the main galleries are on the top floor, off two long parallel corridors, with the collection arranged in chronological order, which gave a strong sense of the development of painting over a good 400 years. The collection is probably strongest in earlier works, and we enjoyed these so much that we battled our way against the flow of a one way system that would not be out of place in IKEA to see these again before we went home. 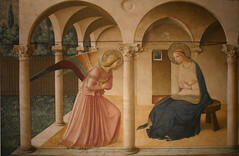 The Giotto virgin and child was breathtaking in its scale and, for its time, innovation, but the Botticelli gallery was the absolute highlight, with both the Birth of Venus and Primavera excelling our expectations, as well as affording us a number of discoveries, such as his delightful Annunciation. They have a DaVinci exhibition on at the moment, which is pretty all-encompassing, but would benefit from having a few more original pieces – the Annunciation in the permanent collection though was another delight. There’s a good representative smattering of Michelangelo’s, Raphael’s and Titian’s, but we felt that much of the work after that failed to maintain the high standards set by the first few rooms. We looked around some of the northern monasteries on our last day in the city – San Marco was a joy, with countless frescos around the shared areas, and the most amazing Fra Angelico frescos in each of the friars’ cells. 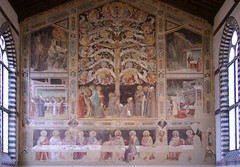 We also enjoyed the church of Santa Maria Novella, in part because this seemed more a place of worship than tourist attraction, but also for its Giotto crucifix and even more frescos, including Lippi’s lives of St John the Baptist and the Virgin Mary in the sanctuary, and Nardo di Cione’s of Dante’s Divine Comedy in the Strozzi Chapel. Four days really weren’t enough to do Florence justice, but it’s rather nice having excuses to go back to the city and see the things which we’d missed out on this trip.